Vote By Mail ballots are mailed to voters within two business days of receiving the request. By law, a mail ballot request must be received no later than 5 p.m. on the 6th day prior to Election Day. Ordering a mail ballot by the statutory deadline does not guarantee that it will arrive at your destination before Election Day. We encourage voters to submit their mail ballot request well ahead of the deadline. Look up your Sample Ballot here. View an "All Races" Sample Ballot here. All mail ballots must be in our office no later than 7 p.m. Election Day. Completed Vote By Mail ballots cannot be accepted at polling places on Election Day. By law, Vote By Mail requests expire after two General Elections. If you would like to Vote By Mail, please make sure you have a current request on file. Track your Vote By Mail ballot and check the status of your mail ballot requests here. Submit a new Vote By Mail Request here. Early Voting for the City of Tampa takes place at seven locations throughout the city. Vote in the location that is most convenient to you! More information is on our Early Voting page. On Election Day, voters must vote in the polling place assigned to their precinct. Find your assigned polling place here. 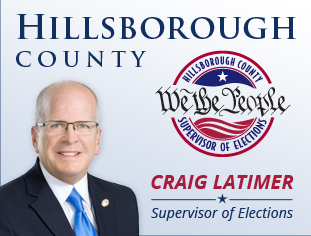 The full list of precincts and Election Day polling places for the City of Tampa elections can be found here. Every election, we have to change the location of some of our polling places. To see which polling place locations have changed since 2018, click here. For more information about Election Day voting, click here.